Saints Peter and Paul Catholic Church is located in the Soulard neighborhood of St Louis Missouri. The first church building of three was built in 1849 on the location of the current church. The Church would serve a congregation that was mostly German immigrants. The currant church was completed in 1875. 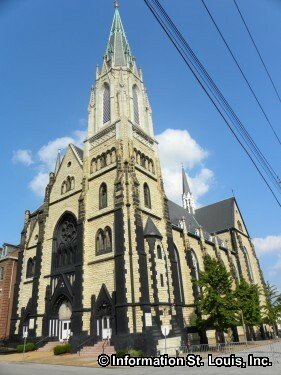 Franz George Himpler, a German architect, designed the church for Father Franz Goller in the German Gothic style, a style that represented the birthplace of Father Goller and his parishioners. Today, the church is still active and holds regular Mass services on Saturday evenings, Sunday mornings and during the week.